This might not be the most subtle of snares, but for less than £100 - including a gigbag! - it's a great little drum and is certainly worth checking out. Bargain price, good sound, good rim shot sound. Some cheap finishing, gigbag needs to be a snugger fit . WHD, the brand previously known as White Horse Drums, has fallen under Gear4Music's wing since 2011. In those two years the stable has released full kits, e-kits, cymbals and snares to the market. It is the latter that we concentrate on today, in the form of a 14"x6.5" steel-shelled snare drum. Immediately obvious when you unpack this WHD snare is that you're getting an awful lot of drum for your money. It's far heavier than you'd expect. It won't suit everyone's taste aesthetically, but beneath its love-it-or-loathe-it hammered white gloss finish is a drum that delivers way beyond its price point. There are a handful of niggles... The badge, for instance, is a little cheap-looking, and on closer inspection the finish on some of the 20 lugs looks rough and ready. For under £100, however, the finish here is more than acceptable. Our gripes are minor and perhaps to be expected at this entry-level price. The gigbag included in the bundle is the Gear4Music High Grade Snare Drum Bag, which retails for £15.99 on its own. So, when you consider that you're getting that chucked in along with the snare and still getting change from £100, you can't fail to be impressed by the value for money on offer here. 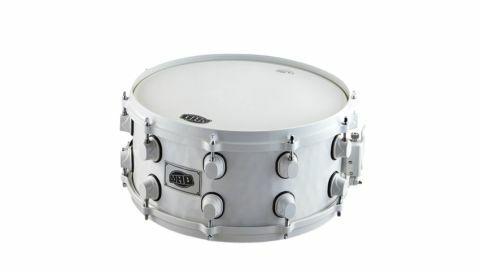 So, on face value it appears that you're getting a lot here for sub-£100, but how does this WHD steel snare sound? Well, pretty darn good, actually. We get a fair sound from the snare with the WHD-branded Remo coated heads that come as standard. Once we swap these out for our own preferred choice, however, the improvement is instantly noticeable. We're able to get a decent pop/rock sound with little in the way of blood, sweat, or tears. Played within the context of a kit, the snare performs admirably, providing a satisfactory 'thwack' at mid tuning. Crank things up a little higher and you'll hear some ping in the sound. WHD's choice of die cast hoops help to mute any wild overtones and keep the sound controlled and consistent. A general concern with budget snares is their ability to handle tonal intricacies. You'll be glad to learn that, in this area, the WHD puts up a decent fight. Part of our extended test of this drum includes a handful of function-band rehearsals, a test which enables us to whisk the snare through a plethora of tracks and styles. The drum gives a good account of itself at the rockier end of things. Give the drum a quarter turn all the way around and it produces a little extra top end. When we take things up a gear it handles rim shots with surprising aplomb. At the other end of the spectrum, cross sticking is more of a challenge. Some notes are almost drowned out by unwanted snare buzz, while ghost notes are often lost to the same problem. This is not a deal breaker, but a sign that the drum is more at home with straight-down-the-middle playing rather than the subtleties of light and shade. The included snare case turns in a somewhat mixed performance. The presence of a stick bag that attaches to the front of the case is neat. However, when the snare is in our review model gigbag there's a little too much space to spare either side. This, coupled with a lack of adequate padding, could cause problems if you want to take this snare gigging. It will need snugger protection if you're going to be chucking it in the back of a car night after night. The WHD 14"x6.5" Steel Snare Drum and Gigbag certainly isn't for everybody, but you'd be hard pressed to find a better package at this price. Beginners and those looking for a rock bottom-priced snare that you can get a decent tune out of need look no further.